Vkare products never fail to impress me. Some time ago I had reviewed the night cream which is very hydrating and at the same time non oily. Let's see the review of another Vkare product and see whether it impresses this time or not. 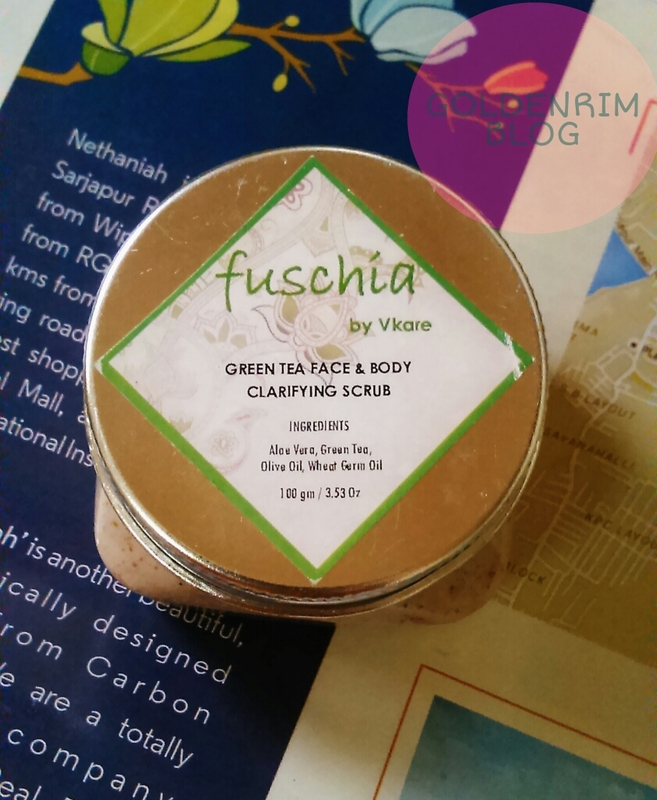 Enriched with catechins, this Green Tea scrub controls acne breakouts. 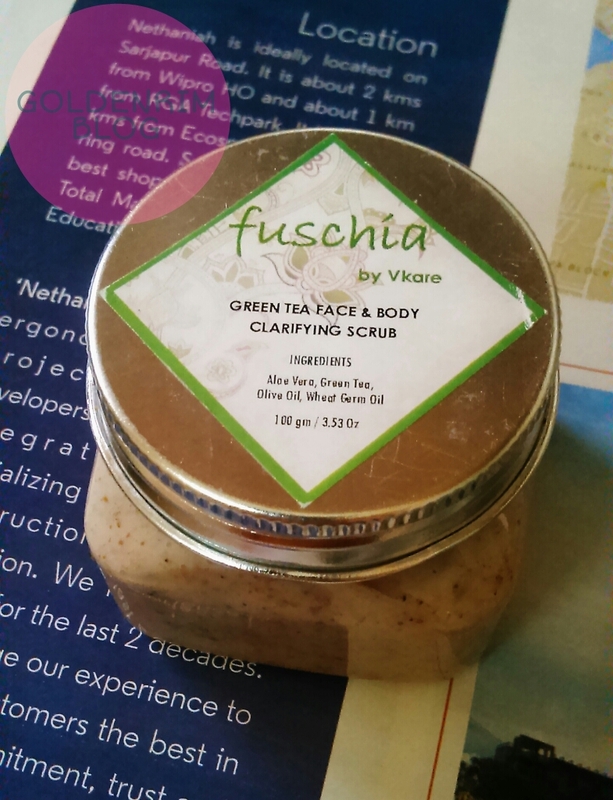 This scrub not only tones and soothes your skin but also delays fine signs of ageing. Firstly let's talk about the packaging, it is a square shaped plastic jar with a metallic twist cap. I personally loved this packaging which can be easily wrapped in a gift paper and ready for gifting. Although I don't mind the tub sort packaging as I use product after washing my hands. The scrub is creamy in nature, wait don't jump to the conclusion that it isn't useful for oily skinned beauties. It is perfectly useful for all skin types as it.doesn't dry out the skin, doesn't irritate as well as doesn't leave any residue. The cream has some orange coloured and walnut sort particles. The density as well as size of the scrub particles is perfect neither small nor big. The scrub brushes off dead skin cells, white heads, oil, dirt. But it doesn't brush away the blackheads. The fragrance of the scrub is very yummy and smells like some freshly made sauce or something. Actually am unable to explain the exact fragrance :D, but it definitely smells like something which can be eaten. Overall am happy with the results of the scrub and would definitely recommend the scrub to all skin types. And since I have no fine lines as well as acne breakouts recently I cannot comment on the brand claims. Price and shelf life - 400 INR for 100 gms and shelf life not mentioned. Availability - Available on major shopping portals as well as on vkarebiosciences.com. I would totally recommend the Vkare Green Tea face scrub if you are looking for an all chemical free scrub. 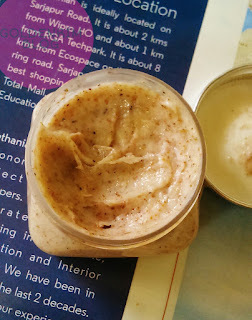 In the past I have used their night cream and lipbalm and even if the products are pricey they never fail to deliver, and this stands true even in the case of this scrub. Highly recommended and worth trying atleast once. Tell me your favourite Vkare products?